Quinoa with Pimento Stuffed Olives, Gold Raisins, and Cilantro works like magic to weave an unlikely mix of ingredients in colorful and tasty way. When’s the last time you had gold raisins with olives and cilantro? Sounds a little unusual, but I’m telling you!! If I jumped off the bridge into this bed of quinoa, so should you!! This is a sponsored post. Bob’s Red Mill was kind enough to send me a box of goods and this was one of the dishes that I’ve prepared with their products. If you haven’t heard of Bob’s Red Mill before, they produce all kinds of goods, ranging from grains and beans to flours and baking ingredients. Some of my of my favorite products are their farro, quinoa, and flours! Give them a try if you are looking for a new brand to cook with! I’ve had quinoa with raisins before. How about you? I usually add in some brown sugar, cinnamon, milk, and toasted nuts and it makes a good breakfast! A good way to start the day indeed. With my breakfast quinoa paradigm stuck in my head, I was a little skeptical of adding cilantro and olives to the mix. But what I figured could make this mix work was the addition of the spices. Plus there is butter and the not so often used (at least in my kitchen) stuffed olives. This turned out to be a jump into the unknown that was very rewarding. Like I’ve been digging for gold for years and finally found some a big gold nugget! An edible one studded with tasty bits of olives, raisins, and cilantro!! The pleasant aromas from all the spices, butter, and onion. What’s yours? That’s probably one of the most important things we miss out on when eating out. Imagine if menus could enable you to smell what I each dish smelled like. Wouldn’t ordering be much more fun? And easier? Maybe one day that will be possible. Who knows! Plus I remember reading somewhere that taste is 70% smell or something like that. So when you plug your nose, obviously, you can’t taste as well. And taste happens both from your nose and the back of your throat in the cavity that goes up to your nose. Everything about this quinoa dish smelled delicious… from toasting to the quinoa and especially after melting the butter. I think that should tell you right away, this will be a delicious dish. But don’t take it from me, find out for yourself! For me, it’s a keeper for sure!! 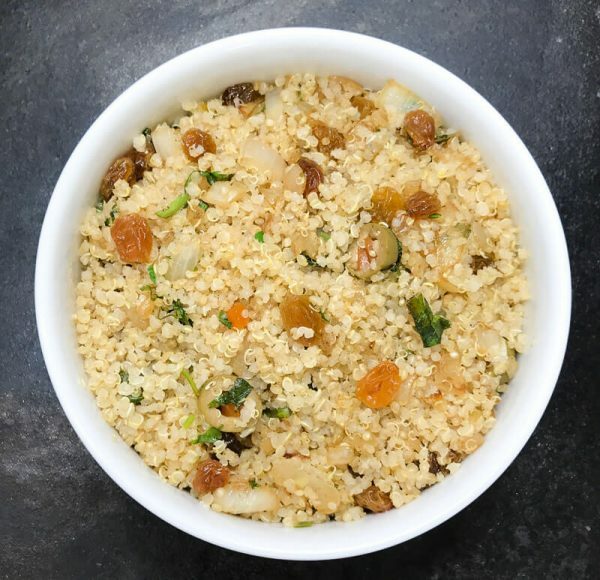 In case you’ve missed them, here are some of my other quinoa recipes! Toast quinoa in large saucepan over medium heat, stirring frequently, until fragrant ~5 minutes. Transfer quinoa to bowl and set aside. 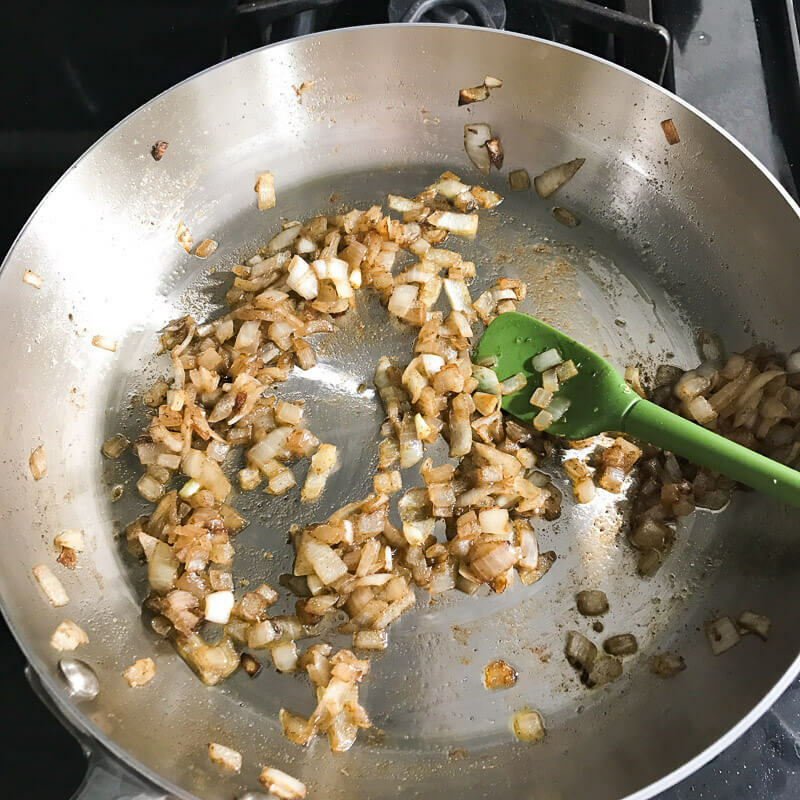 Using the same pan, on medium heat, melt butter and cook onion, salt, cumin, oregano, and cinnamon stirring frequently, until onion is soft ~ 5 minutes. Add in raisins about 5 minutes before quinoa is through cooking and stir once or twice. Fluff quinoa with fork and olives, cilantro, vinegar and mix! Serve warm! In my experience toasting the quinoa results in a different and more earthy flavor that I like, so I usually toast it. Quinoa and I just never seem to have hit it off. At least I learned to pronounce it! Ha its ok i pronounce things funny too ??? ?